Remember those logic puzzles you'd do in school where you have to get the bag of grain, chicken, and fox across a river but can only carry one thing at a time? The brain logic you'd have to twist, taking things back and forth across the river over and over just to get everything where you wanted it to be. She Remembered Caterpillars is a new value-priced puzzler that brings all those old logic puzzle brainwaves back from the depths. Main gameplay in She Remembered Caterpillars sets strict rules in a "fungipunk" world. You control little characters as they move around a single-screen organic landscape. The characters are primary colored and pretty much do nothing but walk. You pop between who you are controlling with a shoulder button. These little friends can also merge: a yellow and red one can meld into an orange, for example. You can merge and split as much as you like, which is integral in figuring out the puzzles. Through the landscape there are puzzles revolving around gates and bridges, which are colored like the characters as well. The bridges allow anyone with their color represented to cross. For example, a red bridge can be crossed by a red, orange, or purple character, as there is red inherent in them. The secondary color bridges, of course, only allow that one color across because they have to contain everything the bridge contains. Any other color tries to cross and the bridge pops up and halts their progress. There are also gates which have an opposite effect: a red gate will let a yellow, blue, or green character through but blocks anything with a tinge of red inside. You might need to get a yellow across a red bridge, so you move a red over to him, merge to orange, cross the bridge and pop back apart. It's this kind of logic that you need to get all the characters to little white spaces on the level to win the round. As you go on, further tricks open up, like bridges that only span when someone is on a particular spot, or a device that pulls color out of a character. The puzzles get more and more devious, and I'd frequently push to get one character where I wanted only to end up with another in the wrong spot. It felt like my attempts at a Rubik's Cube: sometimes getting that one square where it needed to be messed up someting on the other side. The game is straightforward and relentless: there are no clues or hints given, and you have to figure out every one of these rules yourself. There's a wonderfully well done progression that lets you see what each particular barrier does with minimal words so just about everyone can wrap their brain around it. Even the character's shapes change and mix in ways that would allow someone with colorblindness to see what's going on. Given that there is no timer or game over screen, I did find times where I was completely stuck and really just kind of muscled my way through a puzzle by trying every combination I could till something broke. A few of the more confusing puzzles I couldn't tell you how I won. You can go back to earlier puzzles if you want to retry, but there's no help if you get really stuck. I did have fun getting my kids in on the puzzles I got stuck on. Fifteen seconds describing the rules and they fully understood and were throwing ideas my way. For a single player game, it does have potential to be social if you have friends who enjoy brainteasers. Alongside the gameplay comes snippets of a story that deals with love and loss. It's an interesting story but I have a hard time with presentation. You get a sentence or two of text story after each level. All at once they make sense, but if you spend ten or fifteen minutes working on a level your mind gets out of story mode. While there are loose connections between story and gameplay that get stronger as you learn more they never really gel to me. I feel like the game and story are nice, but they don't really benefit from each other. It'd feel weird when I asked my sons for help on a difficult puzzle and then they read a sentence or two about death that made sense to me following it but don't make sense on their own. I think the story may be a little out of my seven year old's depth, regardless of how much he'd like the puzzles. 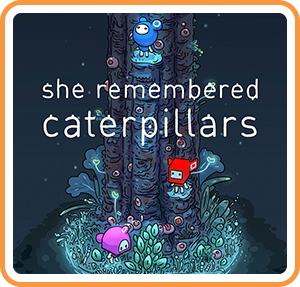 She Remembered Caterpillars is a touching story and a compelling puzzle game that don't quite line up with each other, but that doesn't mean either is a detriment to the whole package. Perhaps I'm wrong or being impatient, but I'd have loved some minimal sort of hint system when I get stuck on a particular puzzle, as there's no way through until you figure it out. I enjoyed stretching my brain through logic puzzles and love how the simple combination of rules can really stump you on the right combination. For the price, She Remembered Caterpillars provides an excellent brain stretch that will fit both in the “just five minutes” and the “just one more” category of addictive experiences. Special thanks to Ysbryd Games for providing a code for review!